Every business dreams of having an outstanding sales and marketing process. Are you in need of developing a "push" or "pull" sales process? Are you in need of training specific salespeople to earn some basic or advanced selling skills? Or perhaps your sales techniques are great but your salespeople need to build their self-confidence and/or get rid of sales patterns that are not bringing in any revenue. Does your organization know it's spiritual purpose? How well defined are your target markets? How well designed are your promotional vehicles for reaching your target markets? Choose Your CLI Power Coach� will assist you in finding a Power Coach who specializes in Sales and Marketing. "I really appreciate how CLI's approach to executive coaching respects me as a whole person. It dares to go beneath the surface to remove emotional, mental, or spiritual blocks. 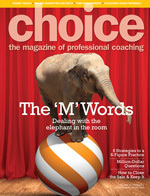 Power Coaching is a great addition to my consulting and coaching competencies toolbox."